The contest is now over, a winner will be chosen in the next day or so and will be contacted for further information. Animation is handled by Madhouse, the studio behind Death Note, Trigun, and countless other anime series and movies. 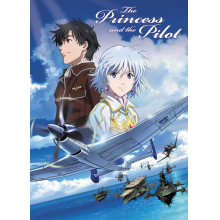 For more information on the film and to watch a trailer, visit http://nisamerica.com/index.php?nav=ap&aid=princess_pilot. -Comment on this post and tell us what your favorite anime film is, or like our Facebook page and respond to the post there if you don’t want to comment on the site itself. -This contest is open to U.S. residents only. -Current Cosmos Gaming staff are not eligible to enter. -Entries will be accepted until June 17th, 2013 (two weeks from the date of this posting), at which point a winner will be chosen and contacted for further information. Currently Castle in the sky is my favorite. My favorite is Howl’s Moving Castle. I watch a lot of digimon with my son! “From Up On POppy Hill” was enchanting! I like my neighbor totoro! Blood-The Last Vampire is my favorite. I liked Rise of the Guardians. Comments are closed for this artilce. NIS America announces WAGNARIA! !2 for North American release! NIS America announces anohana: The Flower We Saw That Day Complete Series Standard Edition!